i was born in texas. my youthwas filled with july 4th weekends spent at the vfw bbq in smithville texas. as far as i know, this spawned my earliest food memory. the best smoked brisket i have ever had. 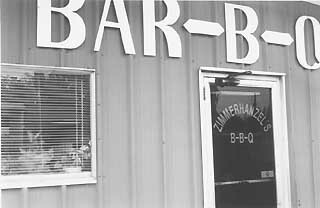 down the road from my grandparents house was a BBQ shack called ‘zimmerhanzels’. i always looked forward to the smokey goodness of their brisket. almost more than the fireworks stand. my grandparents have passed on but their house is still there and so is zimmerhanzels. my aunt fixed up the house and lives there part of the year. my mother goes to visit several times a year and returns with tasty treats from the lone star state. whole frozen briskets from the big ‘z’. i was once stopped by airport security for having 20lbs of foil wrapped brisket in my bag. i think they thought it was something else. my mother recently returned from texas and gave me some of the coveted meat for my own. on the way home i stopped and bought a loaf of white bread. the crumbs are still on my keyboard as i write this.